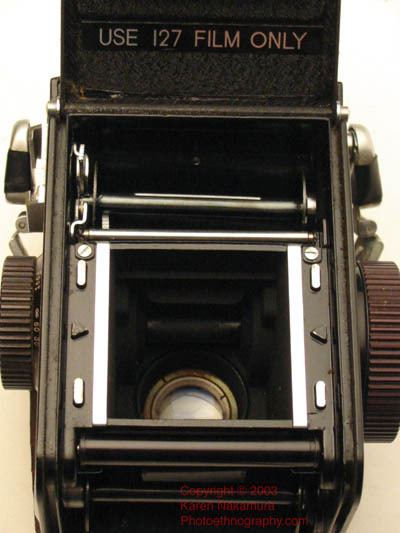 The Yashica 44 LM is a twin-lens reflex (TLR) camera that is basically a copy of the Baby Rolleiflex. It uses 127 size film (just slightly smaller than standard 120 medium format) to shoot 44mm x 44mm "superslide" square format photos. 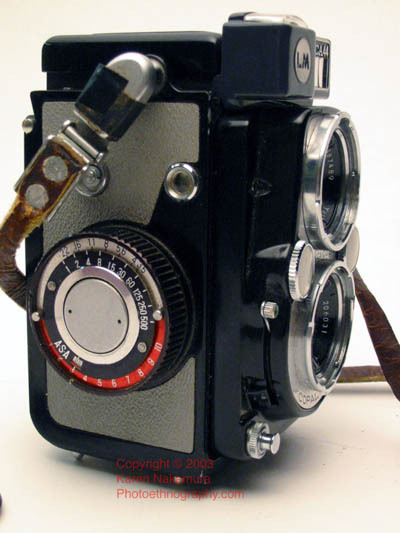 The LM added a "Light Meter" to the Yashica 44, which is based on the Yashicamat system. The 44LM is the last of the 44 series. Using the text or images on this website without permission on an ebay auction or any other site is a violation of federal law. I purchased this as part of a larger lot of cameras at an auction in North St. Paul in 2003.01. I was originally going to sell it to fuel my habit hobby, but looking at the photos that other people have taken (see links below), I was swayed to keep it. The Tessar type lens seems to really glow but in the end I ended up selling it. The camera does not sport a cold-shoe for flash mounting! Instead you use an accessory shoe that mounts over the viewfinder. I talked with Mark Hama who worked in the factory that made these cameras. 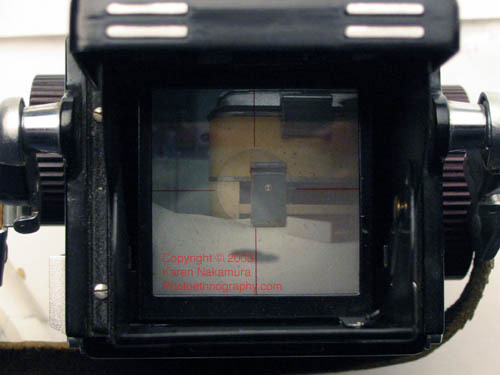 Apparently the 44LM came in 7 different colors and was known as the "rainbox" camera. My own is a light grey. This is the 40 year precursor to the multicolored Hasselblad 501CM! Using the text or images on this website without permission on an ebay auction or any other site is a violation of federal law. Very new to that age, the camera has a built-in partially coupled CDs lightmeter. 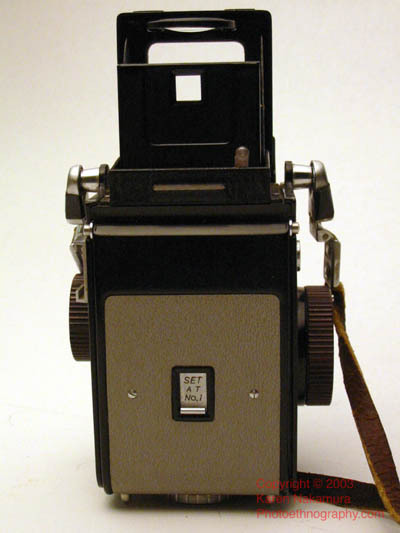 You dial in the ASA speed of your film, the camera body automatically relays the shutter speed, and you push the black "meter" button on the rear of the camera. The dial on the tells you which f/ stop to set your lens to. Great! I can't figure out for the life of me why there's a ASA/DIN film reminder on the left focusing crank; and also one on the right film winding crank! One's to calibrate the light meter, the other is.... all I can guess is that they kept the crank from the older 44. 127 film is harder to get these days, but you can still get it from B&H Photo in New York or Freestyle Photo in California. Yashica 44s are rare, most people will think you have a Baby Rollei. 1 sec - 1/500 sec. Note: Using the text, table, or images on this site in an ebay auction without permission is a violation of your ebay Terms of Service. I will report you to ebay if I discover such a violation taking place. This may result in your account being cancelled. I also reserve the right to file claim for civil penalties. 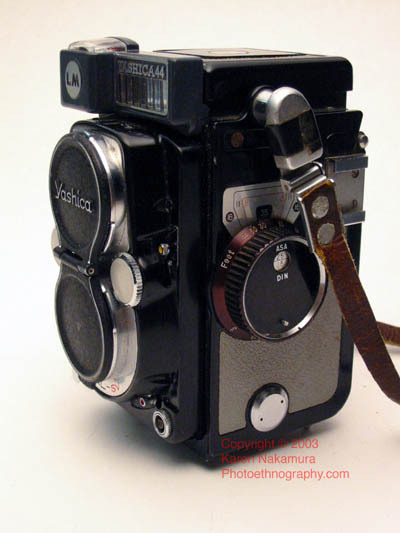 The Yashica Corporation began making cameras in 1957, releasing its first model in 1958 (the Yashica 35). 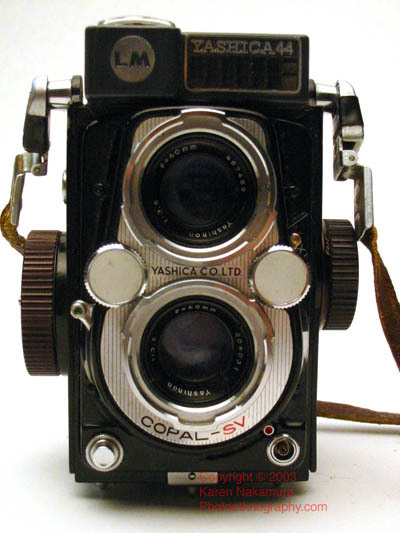 They produced a very well regarded series of twin-lens-reflex (TLR) medium format cameras under the Yashica-Mat brand and 35mm rangefinders under the Yashica Electro name. 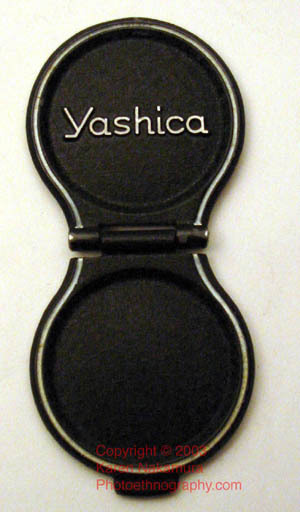 Yashica became a subsidiary of the Kyocera Corporation in October of 1983. For the next two decades, Kyocera continued to produce film cameras under the Contax marquee, including a very nice 35mm Contax SLR series (which used Zeiss lenses), a medium format system, and the Contax G1/G2 rangefinders (also with Zeiss glass).The Yashica name was only used for a small series of dental cameras and point and shoots. In March of 2005, Kyocera announced that it would cease production and sales of film and digital cameras under the Contax marquee. Thus ends 30 years of a wonderful camera line. The Contax name will most probably revert back to the Zeiss foundation, thus who knows what will happen in the future. Right now, the name "Yashica" appears to have been bought by a Chinese company for their inexpensive digital cameras. Copyright © 2002-10 by Karen Nakamura. All rights reserved. This page and its images may not be reduplicated in any form. Use in ebay auctions strictly prohibited, violaters will be reported. Please do not jeopardize your feedback ratings by engaging in copyright violations, it is a violation of Federal and International Copyright law as well as ebay terms of service. Last modified: Saturday, 06-Nov-2010 18:22:25 EDT , [an error occurred while processing this directive] .